Preparation of RFPs for professional consultants to provide the third-party reports required of FHA lenders, such as the following: (a) appraisals, (b) environmental phase 1 reports; (c) PCNA reports; and (d) estimates of costs of rehabilitation work along with concept plans and specs for lender review. Nassau Capital Advisors, LLC currently serves as financial advisor to the Asbury Park (NJ) Housing Authority, along with its non-profit redevelopment partner Maestro Community Development Corp. Working with the Authority staff, we prepared successful applications to HUD for conversion of 274 units to RAD contracts. Following the RAD approvals, we have obtained a letter of intent from a substantial tax-credit syndication group and an engagement letter with a HUD certified MAP lender. These two funding sources are expected to provide the Authority and its non-profit development partner with approximately $14,000,000, which will be directed to the substantial rehabilitation of these units. Nassau Capital Advisors, LLC was engaged by the US Department of Housing and Urban Development (HUD) to provide a day-long training seminar on the latest developments in RAD financing strategies for public housing authorities. 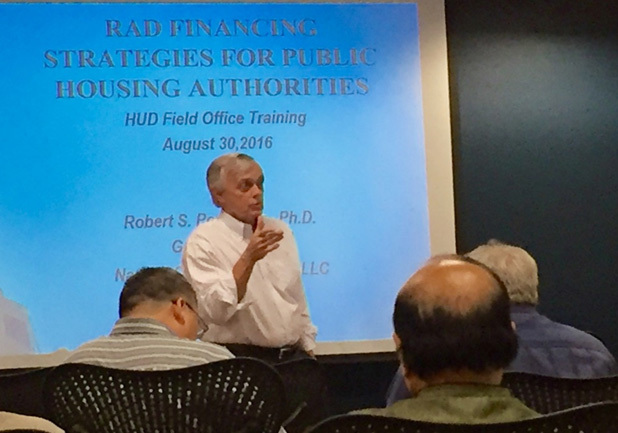 The training, provided on August 30, 2016 at the HUD offices in New York City, was attended by several dozen senior staff from HUD’s Newark, NJ and New York City Field Offices. The Housing Authority of Bergen County engaged Nassau Capital Advisors to implement a comprehensive financing plan in connection with the conversion of 503 of its units of public housing to RAD contracts. We have developed a detailed financial model for the portfolio, and have structured a number of financing options for the Authority that can include substantial funding using 4% tax credits as well as long-term, low-interest loans through FHA/HUD. The housing authority works closely with the Housing Development Corporation of Bergen County, a private, not-for-profit affordable housing developer. Our RAD financing strategy is examining ways this relationship can be strengthened to increase the supply of affordable units in the county. Nassau Capital Advisors serves as Financial Advisor to the Red Bank (NJ) Housing Authority (and its non-profit development partner, Maestro Community Development Corp.). We have taken the lead role in structuring and executing a financing plan for its 90 units of housing which are approved for RAD conversion. The plan will focus on implementing a 4% low-income housing tax credit syndication to raise substantial funding for rehabilitation of the units; we intend to combine the tax credit funds with additional funds raised through a long-term fixed rate loan arranged with a private lender experienced in affordable housing finance. The Borough of Madison (NJ), through its affordable housing trust, engaged our firm to work with the Borough Council and the Madison Housing Authority on ways to raise substantial funding for affordable housing in Madison, utilizing, in part, the conversion of the Authority’s units to RAD contracts, and long-term FHA financing. One of our principals, Gerry Doherty, recently served as financial consultant for 6 completed projects totaling 700-units of mixed-income housing for the Housing Authority for the County of Monterey, in Monterey County, CA utilizing 4% low income housing tax credits, tax-exempt bonds, 9% tax credits and a variety of other funding sources. Total project financing was $150 million. From 2012 – 2014, our firm served as financial advisor to the Hoboken (NJ) Housing Authority. We obtained HUD approval through the RAD program to construct a new 44-unit project on vacant land owned by the Authority, and advised the Authority on the selection of an experienced private developer to undertake the new construction in a joint venture with the Authority, utilizing 9% tax credits, federal Hurricane Sandy grant money and a long-term loan. The financing plan for the new building was conditionally approved by NJ HMFA, but was not completed due to local conflicts among the authority management, PHA board and City Council.